The following comments about attractions in Alexandria have been posted from individuals. We believe that the best reviews of Alexandria, Egypt are written by travellers and holiday makers who have experienced Alexandria first hand and want to share their thoughts. Can you share yours? Please help us expand this section of our Alexandria World Guide. 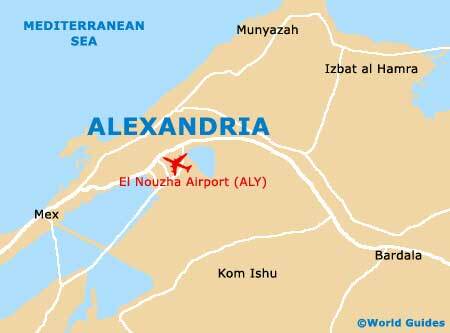 Let us know what you think about the attractions in Alexandria, Egypt. Submit comments about Alexandria attractions here. The area is fantastic and it is particularly special in the evening, although I do advise you go in the morning for a river cruise, as they are fantastic, and I wouldn't visit the waterfront again without going on one. Restaurants vary, as I was advised by friends to avoid certain ones, but where I did go was rather nice. The views are spectacular and I advise people to visit if in Alexandria. Pompey's Pillar is old and I mean really old. It was erected in 300AD and has some really interesting engravings and inscriptions. It is the most famous of the city's remaining ancient monuments and is a part of the acropolis, near to the Arab cemetery. It is massive and well over 20 metres tall, so it really was quite a feat to get it here and in place. The new library in Alexandria is very much an edifice of the 21st century - something quite different from the anicent city. It is quite a contemporary showpiece in the city, with lots of steel and glass, and is supposed to depict the sun rising out of the sea in the morning. There are over 200m000 books insude and some valuable original manuscripts, written on papyri. Outside, the granite walls have been carved to show some traditional Egyptian hieroglyphs. Please note that these Alexandria, Egypt comments and reviews are posted by individuals and are not necessarily the views of World Guides.